Today’s Clear and Simple Stamps group project theme is “love notes.” From my time teaching kindergarten, I have fond memories (or maybe not so fond, given that Valentine’s Day around here almost always closely coincides with the 100th day of school, which is another big kindergarten party event--two parties in one week is way too many!) of those little Valentines with punny messages that my students would painstakingly address and deliver to their classmates. The kids were always so excited to distribute their cards and just as excited to open the ones they received from their friends. I used some of CSS’s new releases along with some old favorites for my own take on these cards. 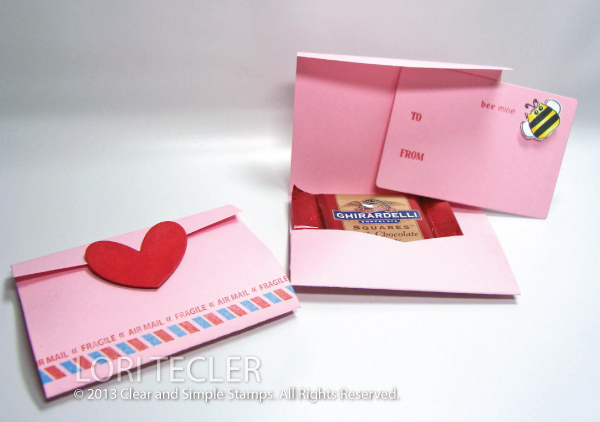 I cut the Mini Tri-fold 2 pieces from pink cardstock, then added a little stamping using images from the Airmail set. The little dashed lines image is super easy to line up and stamp in two colors like I did here. After assembling the tri-folds with Simple Adhesive, I set them aside and got to work on the inserts. 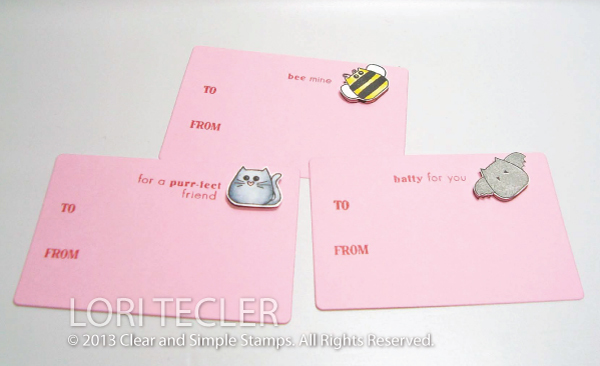 The inserts are made with the rounded rectangle that comes with the Mini Tri-fold 2 die and images from the Taglines: Critters stamp sets. I stamped and colored a few of the critters, then cut them out and used foam tape to attach one at the top of each insert. I stamped the coordinating punny sentiment next to the critter in red ink, then added the “to” and “from” from the Trendy Tags set so they’re ready to be signed. Valentines are even sweeter if there’s candy inside, too, so I set out to find some that would fit inside the tri-fold. The individual wrapped Ghirardelli squares are a perfect fit, so I tucked one of those inside each trifold along with the insert. To keep the tri-fold closed securely, I added a red die cut heart with a piece of foam tape. The tri-fold’s top tab tucks nicely underneath the heart. Lori, these are so sweet! I love that you left room to write a little note too! Takes me back to the days when I would pass Valentine's in school. Such a fun time counting them up at the end of day! Oh you can never go wrong with chocolate!! 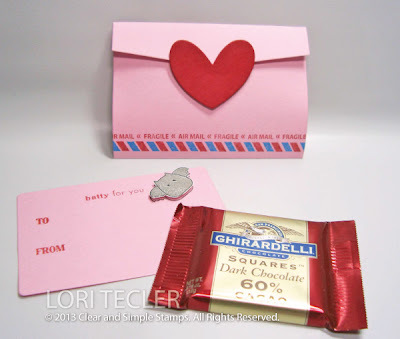 A love note with chocolate? You can't beat that! !